Ebony Williams: Shits for Giggles.. Don't Cross Here Deer!!! Originally I wasn't going to write a blog BUT I saw this video that made me want to post it and share! The things some people believe and actually think is just amazing! 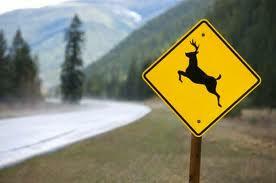 Listen to how this lady truly believes that deer know and comprehend deer crossing signs..